I just need to say....I needed a day yesterday to process things. I was planning to post and was so emotionally & physically drained I just hit the hay instead. It was the most awesome day. Wanna know why? Well, hold your horses. I'm gonna make you wait a minute (and look at some pictures!). REALLY rough ...even jelly or some nastiness was on it. See that red glob on the left of the skirt? (which had just a tiny bit of batting on them...that's it! Hard as rocks.)? 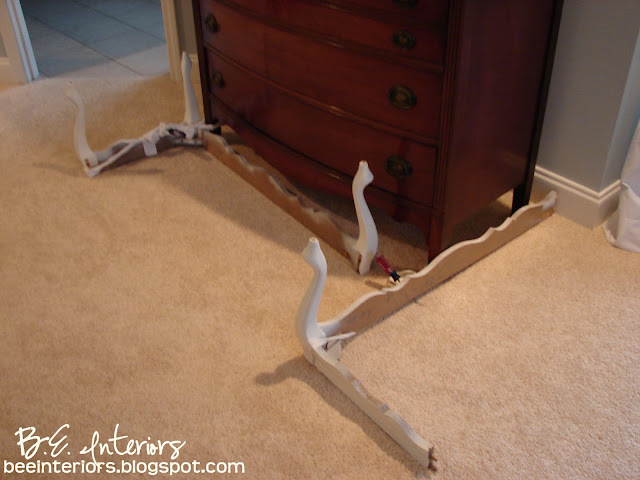 And lastly, see these broken coffee table legs that I forgot to get a picture of before priming and gluing? They The Lord Jesus made me very, VERY happy yesterday! After lucking out being blessed and finding the BERNHART solid wood table and coffee table legs for hardly anything at my favorite thirft store, I got busy hunting for some chairs to match. A sweet man up the road here has a little antique refinishing business he's set up in an old building he owns (no overhead...how nice - albeit, almost literally!). 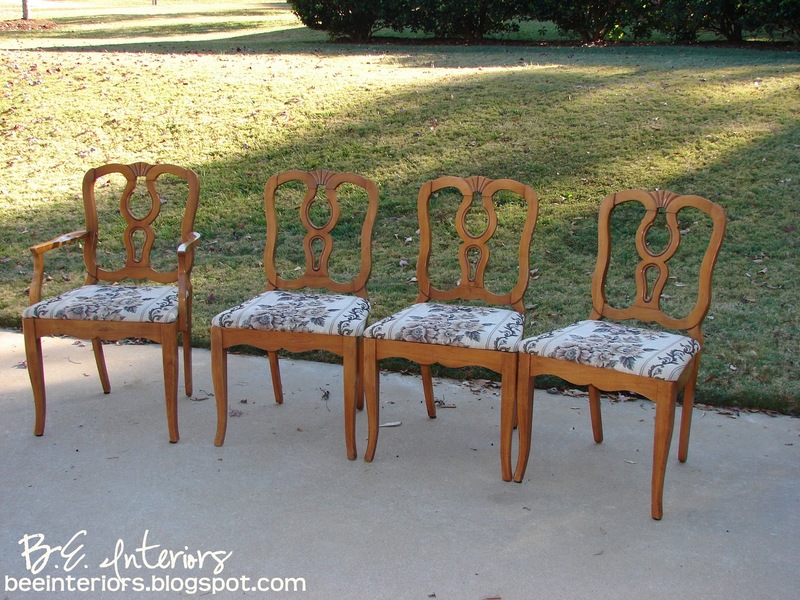 I drove past one day and saw the chairs sitting out front, stopped and took them home when he offered a good price. After having EVERYTHING that could possibly go wrong happen while redoing them, I ended up with a pretty little French Provencial/French Country set I was tempted to keep if I didn't have boys:) I could just picture what it would look like in a matter of days with them sitting on the chairs! I'm not joking when I say everything went wrong. I began hand sanding (because I didn't have an electric yet) and did it until I got rid of the deep gouges (so I thought). I stained the top only to find out one of my little helpers had apparently taken the low grit paper and "helped" making deep scratches that showed up AFTER staining. This was after priming with the wrong primer (like an idiot I listened to the guy at the paint counter who told me the latex primer would stick...I knew better but was too flustered with kids to think straight or question). I also loved distressing. I had a hard time bringing myself to "ruin" such a painstaking paint job, but it turned out wonderful, if I do say so myself. The seats are now quite fluffy and SOFT! If only my back looked this good! O.k. Wanna know why I was so happy? Two things happened yesterday. "Dear Lord Jesus, you know how nerve wracking this is for me. I am literally shaking from the stress and fear of failure. But, I am certain this is what you want me to do. You gave me a talent that I don't want to neglect and I'm now at a point I can do something with it. It brings me such joy (which I know brings you joy) to have a creative outlet like this. I've seen you open my eyes to opportunities, doors to put my work out there, and windows of wonderfully helpful people pointing me in this direction. Even though I'm shaking in my boots because I'm stepping out on faith that I've heard you right - not playing it safe - I pray that you'll give me and my husband some kind of confirmation that I am doing the right thing. Amen"
"Nope. Right after you walked out a couple walked in and bought the set!" "Just had to call and tell you!" I was so excited I jumped up and down. Thank you Jesus, Thank you! Talk about not only answering a prayer, but doing so with a bang! Have you seen him work in your life lately? Notice I didn't ask if He did, I ask if you saw it. I saw some gorgeous and creative stuff over there. Go look! That is wonderful. That set is gorgeous so I am not surprised at all that it sold quickly, of course that was really really quick! 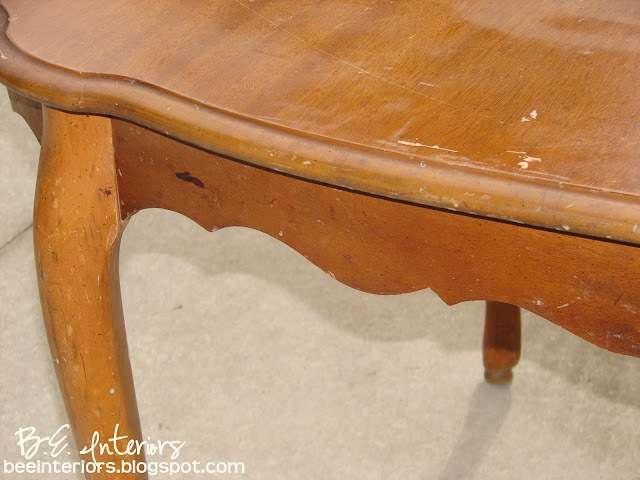 The chalk paint is wonderful for old looking finishes to be achieved. It has to be waxed for it to work and look correctly. I love it, beautiful job. The table and chairs turned out beautifully...congrats on the fast sale...God is good! Fabulous make over! Well done! I just came over from Kim's. You did a fab job on the set, and PTL, a quick sale! I'll be back to follow when the linkys are working again. Come visit when you can, I have a Friday party, Vintage Inspiration Friday, I'd love you to join in! It's so wonderful when we actually open our eyes and see Jesus' love for us! 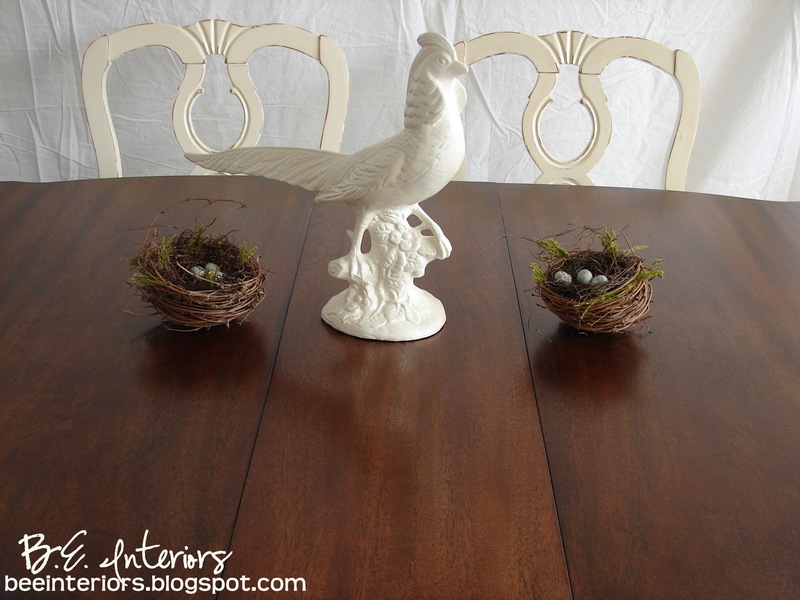 Your dining set transformation is beyond wonderful!! 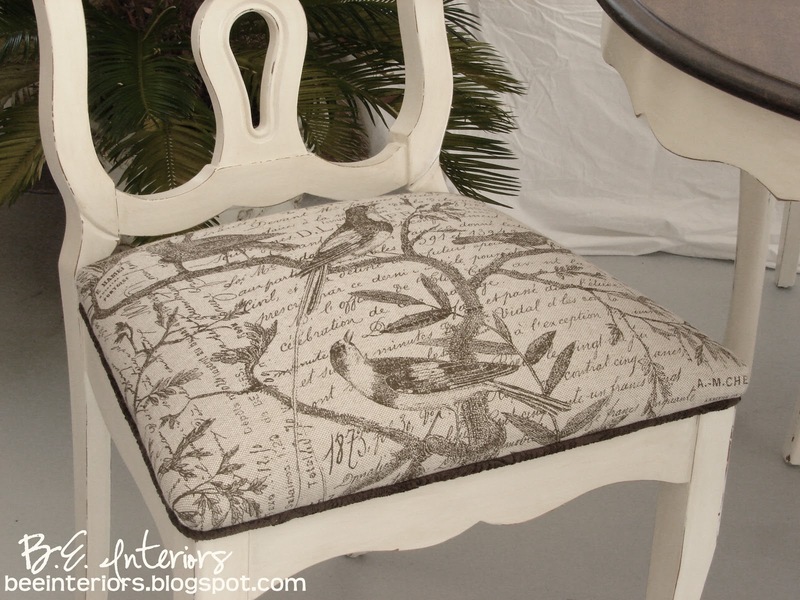 I love the bird fabric and think it was the perfect choice. 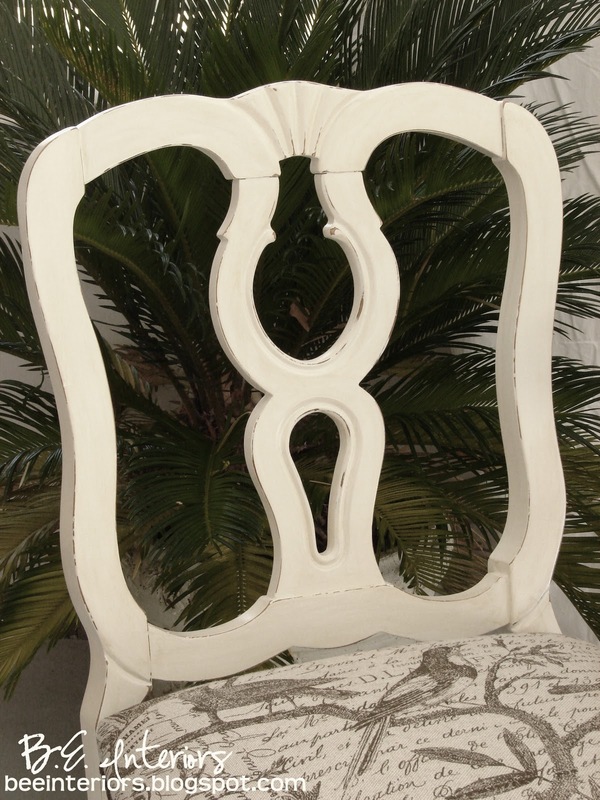 That couple that bought it are lucky to have such a unique, gorgeous, piece in their home! Beautiful! Just saw that Kim featured this on Savvy Southern Style and had to come check it out! Congrats on being featured, congrats on a quick first sale. You did an amazing job! Absolutely gorgeous makeover!! I love it! What a gorgeous job you did on this set. And, don't you love it when your prayers are answered with a "bang"! Wonderful! Looking forward to seeing more of what you do. Just gorgeous....just saw you on Savvy Southern Style and had to see the finished product for myself. And congrats on the sale! Congratulations on a quick sale. That set turned out so beautiful. I know the people who bought are beyond excited. Congratulations! Both on a great job and selling it!!! I am a new follower! Come visit me sometime! Oh I DO LOVE how you post, and your work. I love how clearly you give God the glory! God is good! And your table and chairs are stunning, it is no wonder that they sold so quickly! What a gorgeous job you did.And such a moving post, thank you for sharing. That is so awesome...fantastic job...no wonder it SOLD so quickly...and yes God works great things in all our lives daily...we should keep our eyes open and watch out for his wonderous works. Great post, thanks for sharing, and congratulations! Found you over at Kim's blog what a great job you did It's just amazes me that paint and fabric can turn ugly to just beautiful... Love it... Your newest follower. Can you tell me what color the paint is that you used? I am in the middle of a project very similar to this and we are wondering what color to use and I love the warmth of this. Awesome, Fabulous, Amazing Makeover. That set is ADORABLE, no wonder someone walked right in and bought it! Just found your blog, and i'm so glad i did. Good for you for being brave, and following your dream, doing what makes you shine! This is gorgeous! I found you from WOW, and had to come to the link because I am currently stripping a similar dining set that someone so tragically painted over with forest green paint. It's been a nightmare so far, but I can only dream and hope that mine will turn out as gorgeous as yours! I would love it if you'd come and check mine out, as well as the giveaway I'm hosting this week for darling hair accessories. This is absolutely one beautiful transformation! Love the fabric as well. Beautiful work and yes, prayer does work! Praise the Lord! thats a great table!! awesome job on the "bench"!! love the fabrics too!! OH Honey!!! That is awesome. And the table is nice too. Ha!! No, the set is absolutely unbelievable and I dearly wish I had one just like it. God is so good isn't He? Truly gorgeous! All of your hard work really paid off. I totally understand all of your feelings, congrats on a quick sale! I just saw your makeover on Better After. What a fantastic transformation. It is stunning! Beautiful job. Love your creativity. I just signed a lease for a booth and will move in the end of May. I so get the step of faith and pray I have receive the same type of confirmation. Blessings to you in your new journey. It is a wonderful feeling to expand on what God has already created in us. This looks amazing and great job on selling it so fast! Your booth will do great! No worries! I would like to know what paints you used. I have been wanting to paint our dining room set for a few years now but I have no idea what kind of paint to use. Also how to distress it. Thanks! and I've also recently opened a booth at my local antiques centre. we're on such simlar paths! Congrats on your booth. Your table looked great. I, too, recently opened a booth. I'm finding it challenging to gather items and work on them while being a stay at home mom. Do you feel that too? Love the rustic stained top with the paint. So pretty! 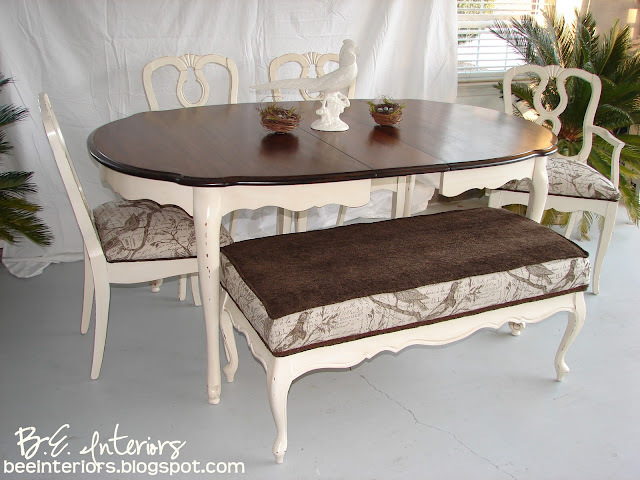 love the result, you did a great job on the table and chairs, love the fabric you chose, the color you used, well done! Im following you from the homemakeronadime creative bloggers' party and Hop! So gorgeous. Really must have hurt to hand it over to someone else, but at least you know you do awesome work! WOW! Love this...turned out beautifully! I just found your blog and seeing you featured at Centsational Girl. I must say you are incredibly talented. The dining set came out amazing. The fabric is really gorgeous. I love how you asked for a sign and you were given such a clear sign. That's wonderful. You definitely have a calling...your work is stunning. I am your latest follower. I hope you will drop by and check out my blog when you get a chance. Very beautiful! Great job! 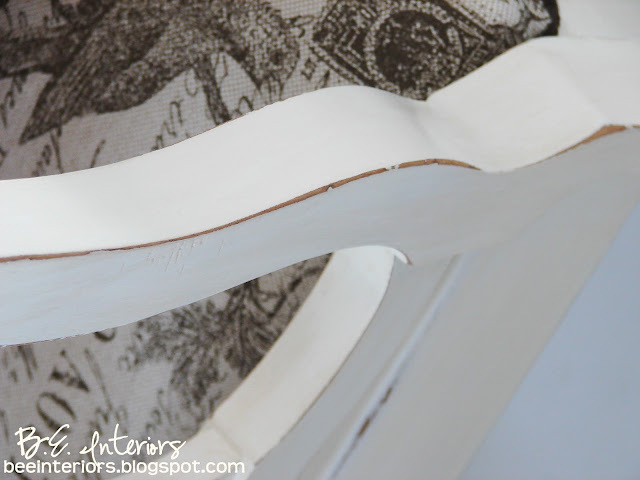 Really appreciate you sharing this great post with us at the Creative Bloggers' Party & Hop. Can you please tell us more about the fabric you used on the chairs? I know you found it as a remnant. Any more info on the brand, etc.? 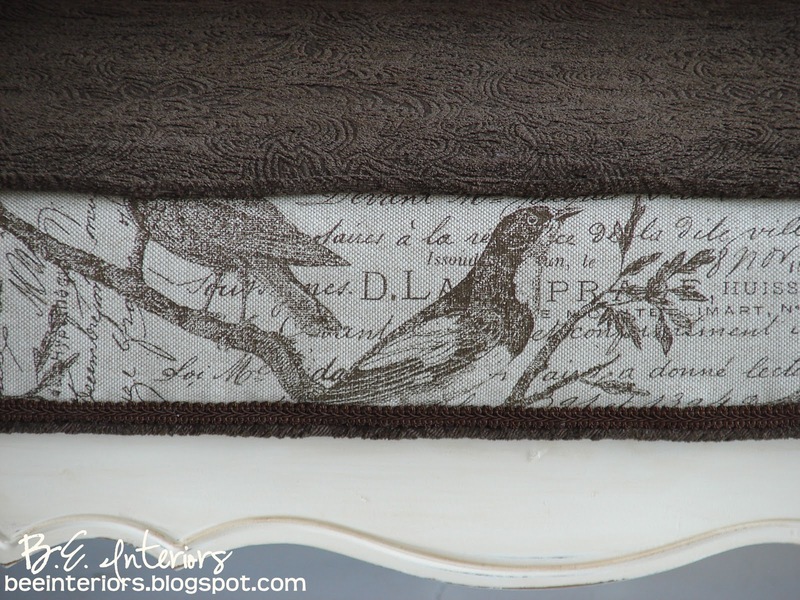 I know Ballard Catalog carries the bird fabric. I have found many of the remnants that I buy can also be found there if more is needed. As far as the chenille, I have no idea, but I'm keeping my eyes open. Lovely! I have an almost exact table with only three chairs that was left when we purchased our first home. We have since moved and we still use it as our dining table. We recently remodeled our kitchen, and I would love to transform our set into the lovely creation that you did. 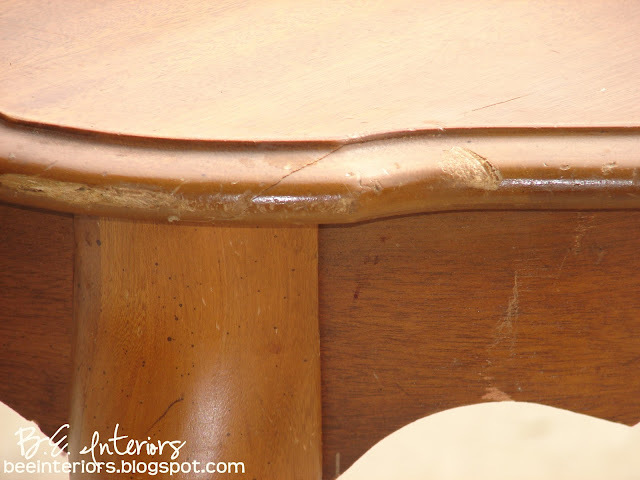 Do you think thatthe color stain you used for the table top would go with black legs? 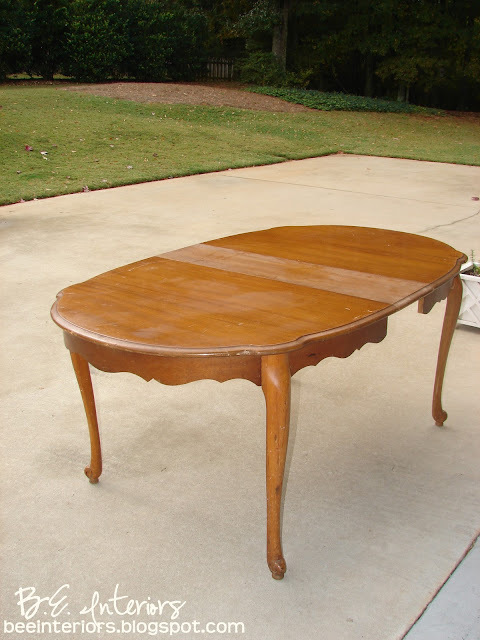 What would I use to refinish the top since we do use this as our everyday dining table and I have 3 little kiddos running around? Thank you for sharing! You have inspired me! Gorgeous! Did you already know how to do the reupholstery? Or is it a 'learn as you go' approach? internet to find out more about the issue and found most people will go along with your views on this website. is time to be happy. I have read this post and if I could I wish to suggest you some interesting things or suggestions. Hey there! This post couldn't be written any better! Reading through this post reminds me of my good old room mate! He always kept talking about this. I will forward this page to him. Fairly certain he will have a good read. Thanks for sharing! great written and include almost all significant infos. I'd like to peer more posts like this . Today, I went to the beach front with my kids. I found a sea shell and gave it to my 4 year old daughter and said "You can hear the ocean if you put this to your ear." She put the shell to her ear and screamed. appears to be like great. I've bookmarked it in my google bookmarks. Hi there, simply turned into aware of your blog thru Google, and located that it is really informative. I'm gonna be careful for brussels. I'll appreciate if you happen to continue this in future. Many folks will likely be benefited out of your writing. Cheers! this subject? I'd be very grateful if you could elaborate a little bit more. Appreciate it! I do not know if it's just me or if perhaps everybody else experiencing problems with your site. It appears like some of the text within your content are running off the screen. Can somebody else please provide feedback and let me know if this is happening to them too? This might be a issue with my browser because I've had this happen before. Hi to every , since I am truly eager of reading this webpage's post to be updated on a regular basis. It consists of good information. year. Music player, P503 supports a variety of media formats. Though it cannot offer you emailing, application downloading, etc. optimum it's able of relatively precise framing. Shot, Story Album, Sound Shot, Dual-Shot and Beauty Shot. best friends. This software can convert DVD to various video formats such as MPEG-4, AVI, WMV, FLV, 3GP, VOB, etc. like to haul around an external flash unit. have become far more susceptible to any kind of a liquid spillage. Select these with the assistance of a chemical engineering professional. to be used for the consumers in the educational markets. However it is not so with the new samsung galaxy note 2.
this tough competitive phone markets. Are you looking for more information on Samsung galaxy unlocked. there are a variety of ways you can do this:. The thinking is much cases are questionable to be settled within large bags time you length. the future and it's time to be happy. I have read this post and if I could I desire to suggest you few interesting things or suggestions. Maybe you can write next articles referring to this article. I desire to read more things about it! I do not know whether it's just me or if perhaps everyone else encountering problems with your blog. It appears as if some of the written text within your posts are running off the screen. Can somebody else please provide feedback and let me know if this is happening to them as well? This might be a problem with my web browser because I've had this happen before. I usually do not leave a response, however I browsed a few of the responses on "Ya'll ready for this? (dun dundah dun dun dah...)". enjoy reading through your blog posts. Can you recommend any other blogs/websites/forums that go over the same topics? I have the same set I want to paint!!! I can hardly believe I came across this! You did such a beautiful job... and I will be the same way with the distressing, but I agree it looks great. I would love to know the color and brand you used for the stain and paint. It would be greatly appreciated. Thank you! New tutorial in the works! Guess what I did today?! Oh, how I love me some burlap!